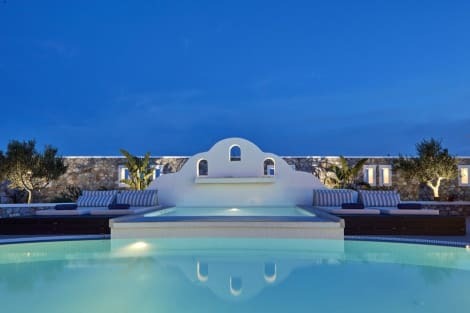 When you stay at Villa Olympia in Santorini, you'll be in the historical district, within a 10-minute walk of Perissa Beach and Perivolos Beach. This apartment is 3.1 mi (5 km) from Santorini Caldera and 6.1 mi (9.9 km) from Athinios Port. Enjoy Greek cuisine at Main Restaurant, a beachfront restaurant where you can take in the garden view and dine alfresco. You can also stay in and take advantage of the room service (during limited hours). Wrap up your day with a drink at the poolside bar. A complimentary buffet breakfast is served daily from 8 AM to 10 AM. Satisfy your appetite at the aparthotel's coffee shop/café. Wrap up your day with a drink at the poolside bar. For your convenience, a complimentary breakfast is served daily. Make yourself at home in one of the 12 air-conditioned rooms featuring refrigerators and flat-screen televisions. Rooms have private furnished balconies or patios. Complimentary wireless Internet access is available to keep you connected. Private bathrooms with bathtubs or showers feature complimentary toiletries and hair dryers. Make yourself at home in one of the 25 air-conditioned rooms featuring refrigerators and flat-screen televisions. Your pillowtop bed comes with Egyptian cotton sheets. Complimentary wireless Internet access is available to keep you connected. Private bathrooms with showers feature complimentary toiletries and hair dryers. Featured amenities include a computer station, express check-in, and express check-out. A ferry terminal shuttle is provided at no charge (available 24 hours), and free self parking is available onsite. Make yourself at home in one of the 20 air-conditioned rooms featuring refrigerators and minibars. Rooms have private balconies. Complimentary wireless Internet access is available to keep you connected. Bathrooms have complimentary toiletries and hair dryers. When you stay at Villa Markezinis in Santorini, you'll be in a shopping district, within a 15-minute walk of Perissa Beach and Perivolos Beach. This bed & breakfast is 3.4 mi (5.4 km) from Santorini Caldera and 6.2 mi (10 km) from Athinios Port. Satisfy your appetite at the hotel's coffee shop/café, or stay in and take advantage of the room service (during limited hours). Unwind at the end of the day with a drink at the bar/lounge or the poolside bar. Continental breakfasts are available daily for a fee. Featured amenities include express check-in and express check-out. For a surcharge, guests may use a roundtrip airport shuttle (available on request) and a ferry terminal shuttle. Make yourself at home in one of the 12 guestrooms, featuring kitchenettes. Rooms have private balconies. Satellite television is provided for your entertainment. Conveniences include desks and refrigerators. lastminute.com has a fantastic range of hotels in Perivolos, with everything from cheap hotels to luxurious five star accommodation available. We like to live up to our last minute name so remember you can book any one of our excellent Perivolos hotels up until midnight and stay the same night.